This beautiful contemporary 4 bedroom home is located in the exclusive gated community of Paseo Las Olas in Dorado, Puerto Rico. It offers approximately 2700 sq ft of living space with 4 bedrooms ( 2 king beds and 2 queen beds) plus 2 air mattresses and futon/couch at the office, 3.5 bathrooms, living room, family room with pool table, dining area, fully equipped kitchen, double garage, fenced yard, manicured lawn, breezy terrace with gazebo and grilling area, abundant windows provide plenty of light and ventilation and private pool. 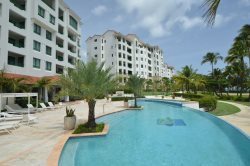 This exclusive, gated community also offers 24 hour security, pool, clubhouse, tennis court and playground for children. 5 Smart TV's with access to Netflix, Amazon video, Hulu, Showtime, HBO, Starz, Pandora music and many more apps. Community Amenities: Security 24 hours, Gated Entrance, Clubhouse with pool, tennis courts and playground. Just minutes from restaurants, shopping centers, movie theaters, and more.